The observed universe is flat. I will explain what it means in practice, before going into a bit of theory. Including a sickle move through the lamentable precedent of the heliocentric system. Basically, when we look at a galaxy which is very very very far away, it appears to have the same size as it should have considering its distance. Ah, yes, because we can determine the distance of a very very remote galaxy, or so we think, by looking at its red shift (how much redder it looks than what it would be if it were next door). This apparently innocuous set-up creates lots of problems for the ruling cosmological theory, the Big Noise Bang. The barnacles attached to the Big Noise, thousands of professional cosmologists, would not be happy to see their ship sink, so they insist it’s doing all right. Yet I am dancing all around with the facts, and, should they read me carefully, they would be less sanguine about the respect they will enjoy, in the fullness of time. Gravitational Lensing. Lensing Without Gravitation Would Signal Curvature. So Would Apparent Size Variations. Neither Is Observed, However far We Look. The Big Noise cosmologists may well be wrong, because they suppose plenty of things for their model. All too many things, some of them, pretty weird. I get to the same observations, while being much more parsimonious with my hypotheses. The bigger the lie, the greater the authority. So great authority loves big lies: it is a training ground for the feeble minds which make authority so great. The greatest philosopher of the Fourteenth Century, and the greatest physicist of the Middle Ages, the Parisian Johannes Buridanus, sent the Ptolemaic system to the bottom of the sea (1320s CE). However Jean Buridan, adviser to 4 kings, and head of the University of Paris, did not want to be burned alive. So Buridan presented all his new physics and cosmology as something “supporters” of the point of view that “authority does not demonstrate” were talking about (he named no names). Even the ship example used by Galileo, 300 years later, to demonstrate the undetectability of uniform motion is Buridan’s invention, for the same purpose (Buridan’s student, bishop Oresme wrote about it too). The Catholic Church, supported by King Plutocrat Louis XI, made reading Buridan a capital crime in 1473 CE. Buridan’s cosmology was posthumously re-amplified by his student and (self) publicist, the dying Abbot Copernicus. That fancy, the heliocentric system, was, on the face of it, quite ridiculous: Buridan said the Earth was “tiny” so it was only understandable that the tiny thing would rotate on itself, while enormous thing would stay put. Why the heliocentric system, was entertained so long explains much of the enthusiasm for the Big Bang. The psychology is similar: an obscure set of ideas was made more hermetic by computations nobody understands. Actually, it’s Plato who launched the Big Ptolemaic Noise, six centuries prior to Ptolemy’s efforts. Believing in the heliocentric system was good training for submitting to stupid authority, and learning to become non-critical. But let’s go back to flatness. Our universe of stars, clouds, and galaxies, is three dimensional (as I often talk of high dimensions, see note: the “3” maybe an average of the “many”). Geometries can be flat (a plane) or spherical (aka “elliptic”; as on a round planet), or “hyperbolic” (a saddle). A mighty theorem (Perelman-Thurston; see technical note on mathematical background) implies that astronomically plausible non-flat geometries contain flat, spherical or hyperbolic elements. Geometries are determined by their geodesics (the shortest paths). At least locally. A non-flat universe means that that some perspective can be found so that two neighboring geodesics will either converge or diverge. For a proof, just look at a sphere, or a saddle; the geodesics can be determined by pulling a string between two points, making the shortest paths. They are the greatest circles in the case of a sphere. Notice that the distances between two nearby strings, once pulled to make geodesics, vary. The big math proof, with equations, does not say anything more. In space, geodesics are paths followed by light. If the universe is not flat, light will either diverge, or converge, as if space itself was a lens. This means that a galaxy, or a galactic cluster, will appear bigger, or smaller, than it should. Some may object that lensing in space is well known, and is even used to look at the furthest galaxies. However that lensing is due to gravity slowing down, and bending light, as happens with light grazing the sun. 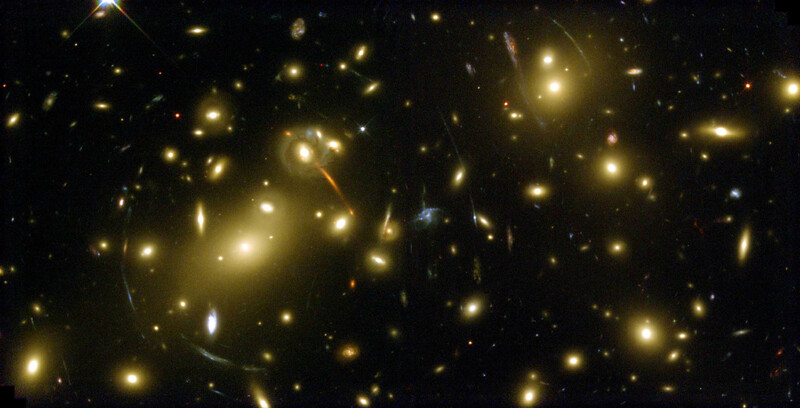 That’s called gravitational lensing. Entire galactic clusters are known to operate as giant lenses. If one saw lensing, with nothing in between, the lensing would not be gravitational and the universe would not be flat. But so far, this has not been observed. There are a lot of mathematical details to figure out, to make that basic idea fit in. It took many stupendous mathematicians and physicists many years working together frantically to figure them out. In particular, Einstein and Hilbert cooperated intensely, helped by many collaborators… And the initial idea comes from the mathematician/physicist/philosopher Riemann (1866). So it took 60 years to make the idea work, and one should not expect casual readers to get the ideas in 60 lines, let alone 60 seconds. An obvious (sort of) prediction was that, as the Mass-Energy of the universe is not zero (it’s full of galaxies, which have mass, and energy), then the curvature could not be zero. But then, if curvature (of the space-time of the universe) is not zero, then the universe has got to be moving. Revolted by a moving universe, Einstein then added another curvature term, Lg. Lg counterbalanced Mass-Energy-Momentum, and gave a static (but unstable) universe. Thus Einstein did not predict what the astronomers were starting to observe, namely the expansion of the universe. Einstein abandoned L (“Lambda”), calling it the “biggest blunder [he] ever made”. Ninety years later, the most basic supernovas were studied. They arise in binary systems: a star transfers part of itself to its companion, a super hot white dwarf. It is a bit like transferring gasoline on an amber: when enough mass has been transferred to Dwarf, the pressure and heat in the depth is just right for thermonuclear fusion to re-ignite explosively. It happens in exactly the same way always (although some argue about this). So these Type 1a supernovae are viewed as candles always of the same luminosity. Large surveys (rejecting some explosion viewed as outliers) concluded that far-away Type 1a explosions were weaker than the Hubble law of expansion predicted. And the further one looked, the more the 1a explosions faded. The conclusion was drawn that the universe expanded faster than the old model of Hubble and Einstein’s Gravitation theory predicted. Greater expansion meant greater energy, and its source was not clear, so it was named DARK ENERGY. Ironically to describe the simplest way to describe it was just to re-introduce the Lg term Einstein had introduced and then rejected, while he blundered about clumsily. It remains that the original theory of Einstein requires a very fine tuning of parameters to make our universe explode into its present very flat state in a bit less than 14 billion years. It also requires a supplementary explosion, called “Cosmological Inflation”. I don’t have this problem. I just wipe Einstein and his cohorts clean. I am master of my own soul. They have two Cosmological Inflations. I have just one, the one that is observed. And my version of the universe can be 100 billion years old, or more. I don’t confuse gravitation and revolution, inflation and what not. The Einstein Field Equations are correct, I just don’t apply them to the universe. Making something complicated simply because it allows to “shut and calculate” (the philosophical doctrine of contemporary physics) has been seen before. This was the trap into which Ancient Greek astronomy fell, making ever more sophisticated versions of the Ptolemaic system. We should avoid duplicating our forebears’ mistakes. That I consider the universe three dimensional may sound as a strange admission, as I always advocate all sorts of dimensions, from the brain to fundamental physics. But not so: just view the three dimensional aspect as an… average. More precisely, this is what happens in two dimensions. In one dimension, the line or circle, there is just one geometry. The USA mathematician Thurston launched a theorem, proven by the Russian Perelman, which showed there were just eight fundamental geometries in three dimensions.